"SWF college student seeks same. Must be willing to share - everything. Killer personality a plus." ... Say hello to Rebecca. She's cute. She's loyal. She's psychotic. And, unfortunately for college freshman Sara (Minka Kelly) she's The Roommate. When Sara arrives at school, she finds new romance with Stephen (Cam Gigandet) and forms a fast friendship with her roommate Rebecca (Leighton Meester). What begins as camaraderie soon turns creepy, and Sara comes face-to-face with the terrifying realization that her new best friend is obsessive, unbalanced ... and maybe even a killer! $15.002 million on 2534 screens. 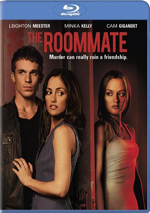 In the same vein as Single White Female, the “psycho chick” genre gets a new entry via 2011’s The Roommate. Sara (Minka Kelly) starts college and finds herself paired with Rebecca (Leighton Meester) as roommate. Sara’s college experience begins nicely; she and Rebecca quickly enter BFF territory, and she also launches a romance with Stephen (Cam Gigandet), the drummer in a band she sees at a party. Alas, the good times don’t last, as we quickly learn that Rebecca has a dark side. She becomes obsessed with Sara and threatens anyone who she thinks might affect their relationship. This goes down a path that becomes darker and darker. But that path never becomes original or memorable. With a thriller such as this, the viewer needs to feel the ability to be in the protagonist’s shoes. We should see things from Sara’s point of view and feel scared because we can sense how our own relationships could turn toxic. That never happened for me, and not just because I’m a guy who finished college more than two decades ago. I don’t need to identify with a specific character to have a movie impact me; heck, I was never a squishy space monkey, but I still cried at ET. I never cared about Sara and her predicament because the movie never gave me a good reason to do so. Sara is a total cipher; she’s a really hot cipher, but she’s almost completely devoid of any personality. We don’t buy into her situation because we don’t buy into her; she’s so dull and forgettable that she makes no impact on us. That hamstrings our ability to feel fear/tension in regard to her predicament. Maybe such an undefined character should make it easier to identify with her; after all, it should be simpler for us to place ourselves onto a blank slate. But that’s not what happens here, so we remain distant from Sara and her tale. It doesn’t help that Roommate offers such a relentlessly cliché and predictable story. We’ve literally seen it all before; from Single White Female to Fatal Attraction, the subject’s been done to death, and it’s been done much better. Maybe the movie’s teen target audience won’t suffer from this “been there, done that” factor, but older viewers will. Though if Roommate executed its story in a more satisfying manner, the predictable side of things wouldn’t matter. I see plenty of movies with simple characters and inevitable stories that still entertain me; often it’s much about how the tale’s told than anything else. And Roommate tells the story in a dull, plodding manner. Subtlety? Forget it. It telegraphs points from a remote distance and does nothing to quicken the pulse. It’s too dull to be a good thriller but it’s not funny enough for satisfying camp. That leaves Roommate as a slow, boring attempt at terror. The Roommate appears in an aspect ratio of approximately 2.40:1 on this Blu-Ray Disc. No notable problems emerged in this positive transfer. Sharpness usually looked solid. A few wide shots showed a smidgen of softness, but those were minor, as the majority of the flick displayed nice accuracy. Jaggies and shimmering stayed absent, while edge enhancement failed to appear. Source flaws were a non-factor, as the movie stayed clean. Where would the modern filmmaker be without teal, amber and orange? Forced to tell stories with fewer clichés, I guess. Despite this, the hues appeared well-developed and displayed good range for what they were able to do. Blacks seemed deep and tight, while shadows were decent; they could be slightly dense, but they remained positive for the most part. In the end, the image was consistently pretty fine. As for the DTS-HD MA 5.1 soundtrack of Roommate, it was good but unexceptional. Most of the movie concentrated on dialogue and atmosphere, so other elements didn’t do a whole lot. Still, music used the five channels in a compelling manner, and various street scenes boasted reasonably nice life. Parties also were pretty involving, though music became the biggest factor in those. Audio quality seemed fine. Speech was crisp and distinctive, with no edginess or other concerns. Music was full and rich, while effects came across as lively and accurate. The track boasted good low-end when appropriate. The somewhat restricted soundfield made this a “B-” mix. The disc fills out with a few extras. An audio commentary with director Christian E. Christiansen offers a running, screen-specific take on cast and performances, story and script, sets and locations, cinematography and visual design, influences and his path to Hollywood, music, and a few other production areas. Despite some occasional lulls, Christiansen provides a pretty good commentary. He’s a lively and engaging speaker who seems happy to discuss his film. Christiansen delivers a consistently entertaining and likable chat here. Seven Deleted and Alternate Scenes last a total of six minutes, nine seconds. We find “Alternate Main Title Sequence” (1:49), “Frat Party ID Check” (0:22), “Book Store Snotty Girl” (0:27), “Sara Contemplates Her Situation” (0:32). “Rebecca Follows Irene” (0:47), “Dancing in the Club” (1:06) and “Irene Wakes Up After Partying With Rebecca” (1:06). To call these clips forgettable would be an understatement. They’re minor deletions and nothing even vaguely memorable or interesting. Three featurettes follow. Obsession: The Making of The Roommate runs eight minutes, 45 seconds and provides notes from Christiansen, writer/executive producer Sonny Mallhi, producer Doug Davison, production designer Jon Gary Steele, and actors Minka Kelly, Leighton Meester, Cam Gigandet, and Aly Michalka. This show looks at the movie’s story and characters, how Christiansen came onto the project and his approach to it, cast and performances, and visual design. The program provides some basics; it’s not bad for a quick promo piece, but it doesn’t offer much meat. The Roommate: Next Generation of Stars goes for five minutes, 27 seconds and includes remarks from Christiansen, Kelly, Meester, Gigandet, Michalka, Mallhi, Davison, and actor Frances Fisher. As implied by the title, this one covers cast, characters and performances. It’s too short for much substance, and praise dominates, but we do get a couple of decent notes. Finally, Dressing Dangerously goes for three minutes, 57 seconds with statements from Davison, Christiansen, and costume designer Maya Lieberman. We get some thoughts about clothes featured in the movie. Lieberman dominates and offers a few nice insights into her work. The disc opens with ads for Insidious, Just Go With It and Country Strong. These also appear under Previews along with promos for Beastly and You Got Served: Beat the World. No trailer for Roommate shows up here. Despite a cliché story, The Roommate could’ve been a satisfying thriller. Unfortunately, it offers no actual thrills and suffers from a serious case of the blahs. The Blu-ray provides very good picture, acceptable audio and a decent set of supplements. We find a reasonably positive Blu-ray for a boring attempt at a thriller.